I shared my favorite cracker recipe a while back, but I wanted to revisit it today because in my fascination with fermentation, I’ve found that it works really well as a sourdough cracker recipe. And I guess, why wouldn’t it? The thing I really love about these crackers is the texture – light and really snappy. And the flavor of the cracker base is perfect for showing off middle eastern spices like coriander, cumin, and paprika. Because the rise time is only a couple of hours, these won’t have a super sour flavor unless you lengthen the rise time by either using less starter (cut it down by half and adjust the rise time accordingly), or by refrigerating partly risen dough for several hours or overnight. 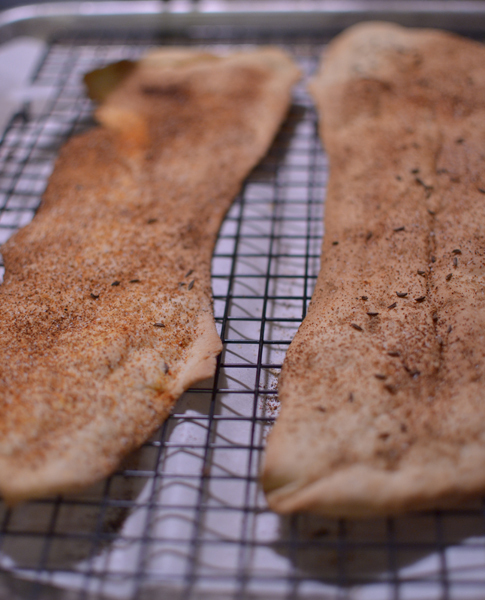 I’m just sharing the quick and easy method for making sourdough lavash – which, I like to imagine, was the traditional way of making flatbread hundreds or thousands of years ago. Envelopes of baker’s yeast haven’t been around forever, ya know. Mix the flour, salt, and sugar in a medium bowl. Stir in the oil and starter, and gradually add the water until the dough comes together into a ball. You might not need the whole 1/2 cup, but I used it all, plus a little more. Turn the dough out onto a lightly floured surface and knead for 7-10 minutes, until it is elastic enough to pass the windowpane test (best dough-making trick I’ve ever learned). Place the dough in a lightly oiled bowl, cover with plastic wrap or a damp cloth, and let it sit in a draft-free place for about 3 hours, until it has doubled. Press the air out of the dough, and divide it into 4 parts. Roll each portion out until it is paper thin and almost translucent, either on a lightly floured surface or cloth, or with a pasta machine (my preferred method). Gently transfer the dough to parchment-lined baking sheets (2 crackers per sheet). Now for the best part: lightly sprinkle or brush the dough with a little water, and top it with a sprinkle of salt and whatever herbs or spices strike your fancy. Some that I have used are coriander, cumin, garlic powder, onion powder, black pepper, cayenne, caraway, and berbere seasoning. Sesame and poppy seeds are a very traditional topping, too. My favorite is a combination of coriander, garlic powder, and onion powder; the crackers with coriander, onion, and caraway come in at a close second. If you make these, please comment with your favorite toppings! Bake the crackers at 350 degrees for 15-18 minutes, until they are golden brown and crisp. I would recommend rotating them halfway through, and checking them towards the end of the baking time – there is a fine line between perfectly browned, and burned, when you’re baking something that’s so wafer thin. Tags: baking, bread, fermentation, recipe, snack, sourdough, vegan, vegetarian. Bookmark the permalink. Previous post ← Bravery: the story of a yucky old bar cart.